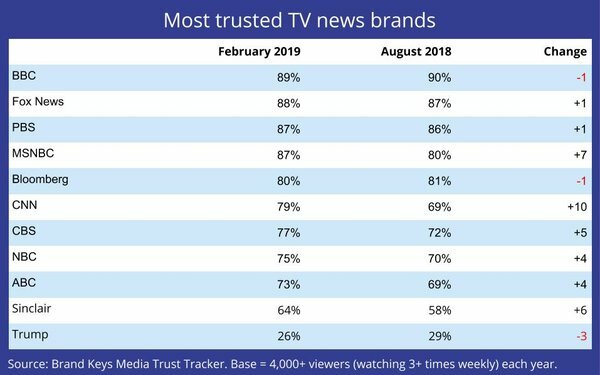 Trust in TV network news brands appears to be tracking overall political momentum. With few exceptions -- most notably gains by right-wing local news broadcaster Sinclair -- left-wing news networks experienced the greatest gains since we conducted our first wave in August 2018 to benchmark network TV news brand trust. We planned to wait until after the midterms to conduct our second wave, but delayed it, due to the government shutdown and waited until after the President’s State of the Union address and fielded it Feb. 6. To determine how much the value of “trust” engendered when it came to individual news brands, 4,060 viewers rated the brands watched regularly (3+ times a week) via the Brand Keys Emotional Engagement Brand Analysis. The top three ranking remained essentially unchanged with the BBC again in first place, followed by Fox News and PBS. The biggest gainers were "mainstream" or networks perceived as having a left-leaning orientation: CNN (+10 points), MSNBC (+7), CBS (+5), NBC (+4) and ABC (+4). While Sinclair isn’t a network newscaster, we began tracking it in wave one, because it has made a commitment to programming a strong right-wing political news perspective across its local stations. The strategy appears to be paying off, as Sinclair’s trust level jumped 6 points between the two waves. The biggest loser wasn’t actually a news network, but a dominant source of network news coverage: President Trump. He lost three points. That said, the news trust perceptions of Americans appears to be going in the opposite direction, even among respondents who declared themselves Republicans. Respondents, examined by political affiliation, indicated the following “trust” levels in the President: Democrats 10% (-4%), Independents 19% (-3%), and Republicans 30% (-5%). Nineteen percent (19%) had no opinion. 2 comments about "Left Wins Midterms, Media Trust Too". Douglas Ferguson from College of Charleston, February 21, 2019 at 11:19 a.m. So it seems Lara Logan is correct about 85 percent of journalists. In post-truth news media, viewers get the news that soothes them. Tom Tyler from GCTVTexas, February 23, 2019 at 1:05 p.m. However, since this poll was conducted: 1) Democrats have lost any momentum from the midterms in the battle over wall funding and the shutdown; and, 2) the so-called "mainstream" orgs have further destroyed their credibility with the Covington and Smollet scandals running back to back. When the Meuller report is released, and everything the "mainstream" outlets have been reporting about "Russian collusion" are proved false, there will be further erosion of the perception of "mainstream media" credibility.